In 1989, over half a million peaceful people, mainly students, assembled in Tiananmen Square, Beijing, China, to protest the corruption of the Communist government. In retaliation, army tanks were sent to clear the Square. One anonymous man stood in their way and the tanks held their fire. This anonymous man has come to be called Tank Man. Eight days later the Army violently cleared Tiananmen Square. Thousands of unarmed protesters, mainly students, were killed or injured. 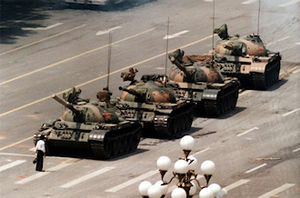 Time magazine voted Tank Man as one of “The Most 100 Important People of the 20th Century.” He remains unidentified. There is another drama here. Lucy Kirkwood, in her 2013 smash hit London play, “Chiamerica,” startles her audience with a shocking question…what about the Chinese tank driver who did not follow orders and refused to roll over Tank Man? Is not the tank driver a hero as well? This Chinese tank driver also remains unidentified. See a startling video of the anonymous hero. The man in the tank and the man in front of the tank are unknown to us. I don’t believe they are unknown to the powers that be in China. It is sad that we live in a world where such heroism is still needed from time to time. Thanks, Kirby, for reminding us that we are blessed to live in a country where we can honor unknown heroes w/o fear of reprisal. That was a vital reminder. I was deeply moved by the horrors of the Chinese leadership’s brutal response to citizen protests. When that one man, stood up to those tanks it gave me chills. However, as life moves us along, so many life changing moments fade to the background and then we forget. Thanks for the post. Let’s applaud him. Let’s thank him. Of course our applause and our thanks will not to be received by him. Let us then be thankful that he demonstrated, once again, that the human spirit is indomitable.